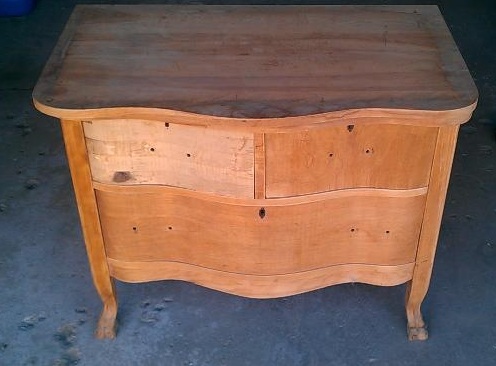 Shaving the dresser top down for an improved look. That’s G, my husband Greg. 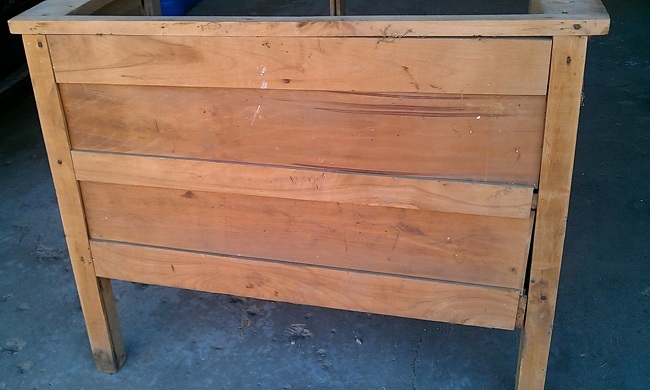 The condition of the back as purchased from the craigslist seller. 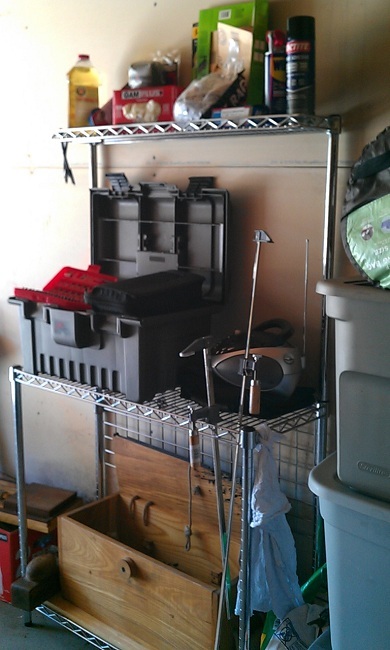 Some tools and workspace. 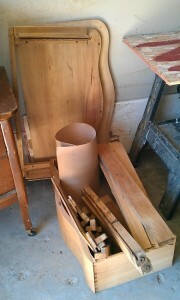 Taking dresser 1 completely apart. Reinforce and clean up then put back together. 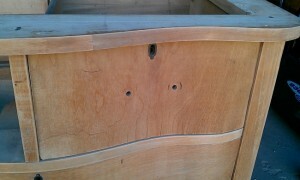 Two upper drawers needed the veneer replaced (it was a hodgepodge of woods which was typical back then). 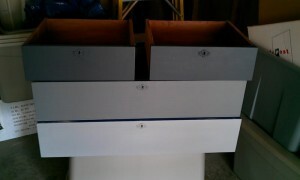 New veneer to glue to the drawer fronts. After many many hours, after priming, time for paint. 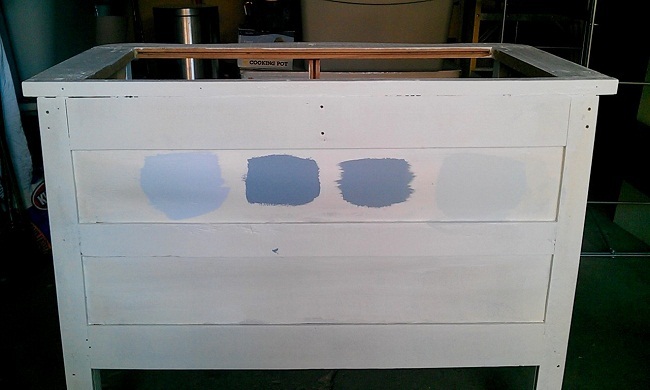 None of these worked for me so the final color took 3 trips to different stores. We were on hold with dresser 1 (waiting for mailed materials) for almost 2 weeks. 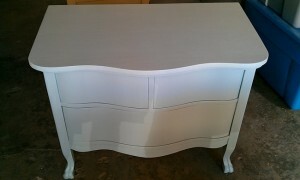 Side pic of our most recent dresser project below. I love the paneled sides. I think it takes away from the more feminine characteristics to make it neutral and appeal to a larger audience. Simple is better in my opinion. I’m going for the silent, take your breath away reaction. Not the one where the voice goes up a few pitches and cries out how adorable/cute/precious the piece is. No frills, nothing pointing it to the girly side just sophisticated, chic and sometimes a little different. That’s my goal. That’s what keeps me going. I do what I like and hope someone else enjoys it that much or more. G and I started work on another dresser while waiting for our milk paint to arrive with great character and very sturdy/solid/last for another hundred years piece. Refinishing it was so much faster/easier, especially when we didn’t have to take it apart, remove the old paint, rebuild parts and prime. Nice. 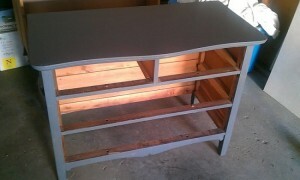 Progress: 1 coat of dark grey paint (not purple as this appears) on all parts of dresser 2. 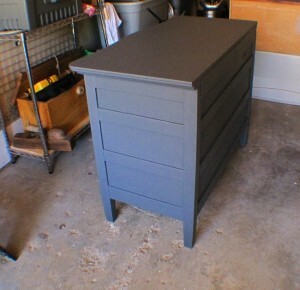 I love how dresser 2 (aka grey dresser) turned out. 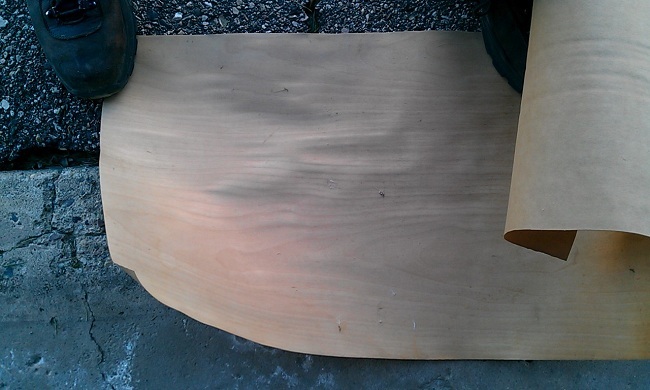 A few coats of wax and poly finish. I don’t know if I can part with it. This was a glimpse from our poorly lit garage-a shot that makes it look slightly purple instead of grey (still). 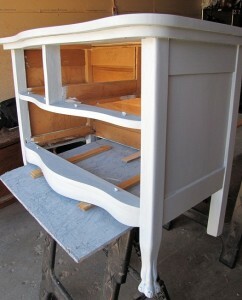 Finished dresser 2. 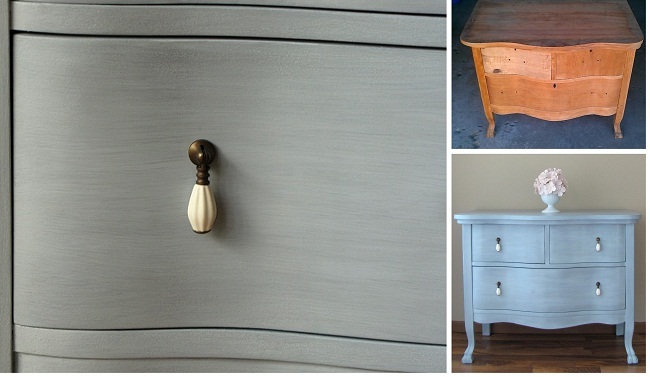 Dark French grey with antique brass and mother-of-pearl knobs. 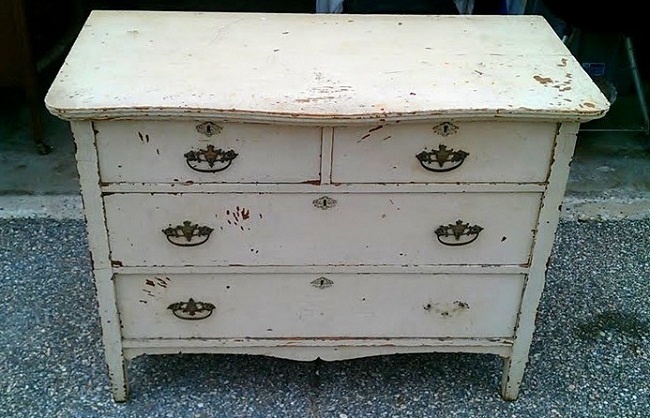 The cream paint has been left underneath the grey if distressing is desired and the drawers are painted an off-white shade. Love it. 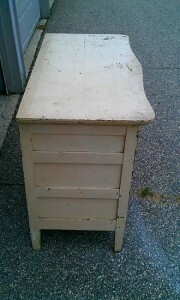 Will be hard to sell this piece but alas, it is on etsy and craigslist. Sigh. 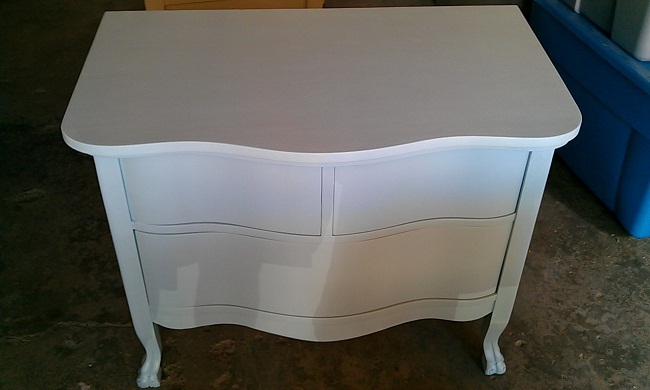 Here’s dresser 1 all dolled up and ready to go. 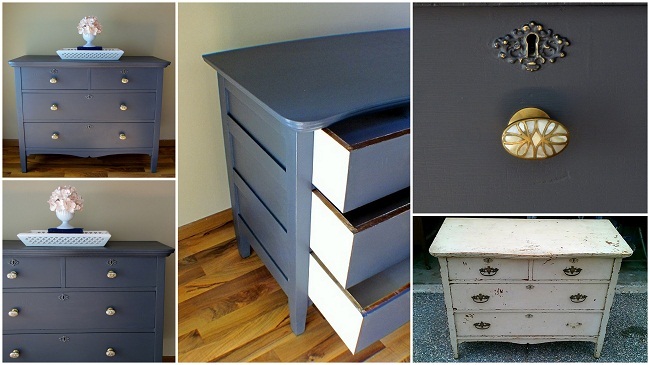 It’s a beautiful, one-of-a-kind milk paint finish with blue/grey paint. The pulls are antique brass with ceramic cream gourds. 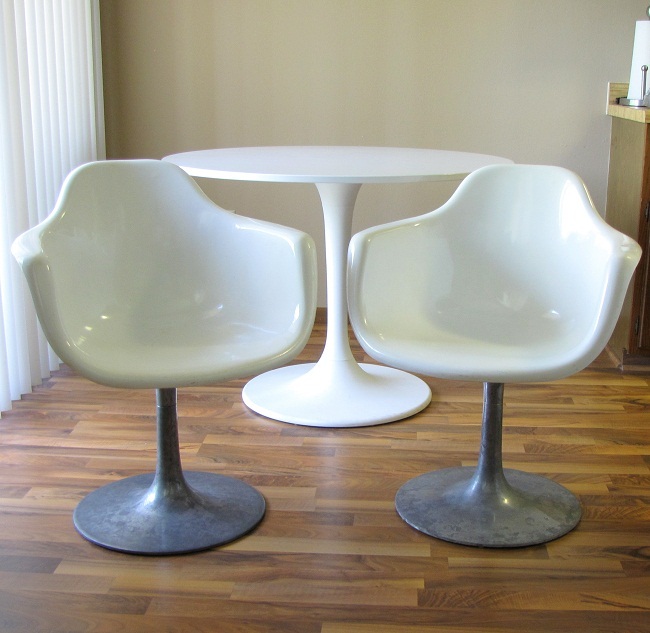 If you live near Northfield, MN and are interested in purchasing this refinished piece, send us a comment. (The color/finish is best displayed on the close up knob picture.) It’s in our etsy shop and craigslist. There you go, dear readers, you are basically caught up. We’ll be visiting family and friends mid to late August so we’ll be on hiatus (i.e. looking for more pieces spanning from Minnesota to Indiana with a pause in Chicago). And if you happen to be one of our supporters through this process, coming in from my food blog (the Dabble), thank you. Just a huge amount of gratitude and love coming your way. Without you, the last few years at that site would mean very little to me. Thank you! Milk paint can be such a wonderful thing to use. 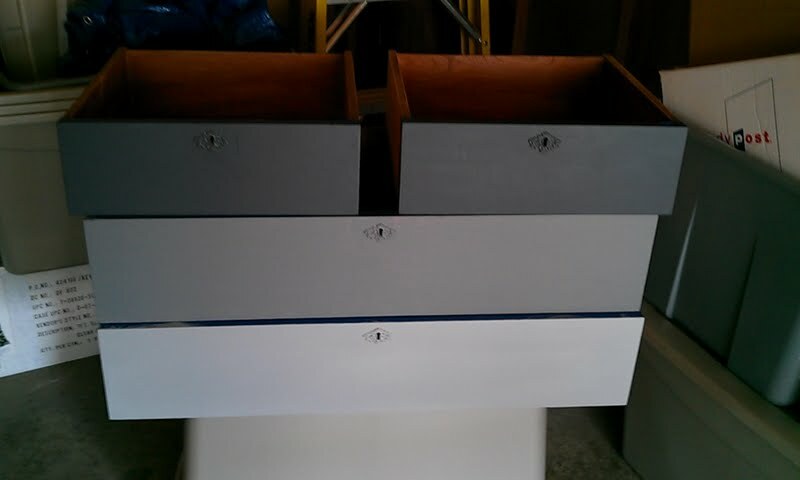 That said, it is not great for places that are going to have water/wet items placed on it unless you are doing a heavy duty finish coat of poly or another durable finish. 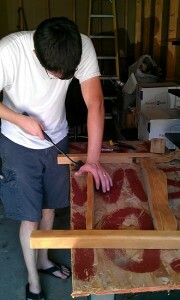 So I would recommend a really good sealant like furniture wax or hemp oil. I hate to be a bummer but as far as that dresser went, we first used a latex paint then did a glaze with the milk paint (can’t recall the amount of water to the powder) and some rubbing with steel wool. It was really just a trial of that technique and I doubt we could even recreate it again. It was such a hit though. Milk paint always turns out a bit different so it’s not easy to plan what you want it to look like. It has a mind of its own! We have only used the Old-Fashioned Milk Paint Company products http://www.milkpaint.com/path_colors.html but Miss Mustard Seed has a line out and she is a great resource for chalk or milk painted pieces. http://www.missmustardseedsmilkpaint.com/products/ Also a bonding agent would be a good idea especially if it was painted or has had varnish on it. Otherwise, it will be chipping off which is neat but you may not like it on your kitchen table. If you have any more questions feel free to contact us. I’d love to see that table when you’re finished! Thank you, Angelica! Unfortunately I do not remember exactly the color but I would guess it was Olypmic brand Knight’s Armor and the knobs are from Anthropologie. They no longer have the oval shaped but do have a round last I looked. Sometimes you come across them on ebay.